American bear culture mirrors the general animal culture. We celebrate the strength of bears by naming sports teams after them. We continue to fear bears, evidenced by popularity of media stories about bear attacks. Bear identification made simple boils down to the types of bears in North America, specifically the three native bear species, the American Black Bear, Brown Bear and Polar Bear. The all belong to the genus Ursus and a brief review of some fun bear facts follows. The American Black Bear (Ursus americanus) once inhabited most North America forests. Habitat destruction, hunting and other factors have limited its range over time. However, black bear populations still exist in many northern and coastal forest areas from the east to the west, along with small southern and Rocky Mountain populations. Ranging in size from four to six feet, black bears are the smallest of the three native North American bears. Omnivores with a keen sense of smell, they almost literally follow their nose while foraging for food. Traditional forest foods include mushrooms, tree bark and small mammals. Fans of people food and bird seed, black bears are often inclined to roam residential areas, corn fields or camp sites in search of a meal. Black bear population estimates vary from state to state, depending on how wildlife officials do their counting. There are no exact statistics on aggregate population levels, however, recent population research suggests an overall increase in black bear populations over the last fifteen years. 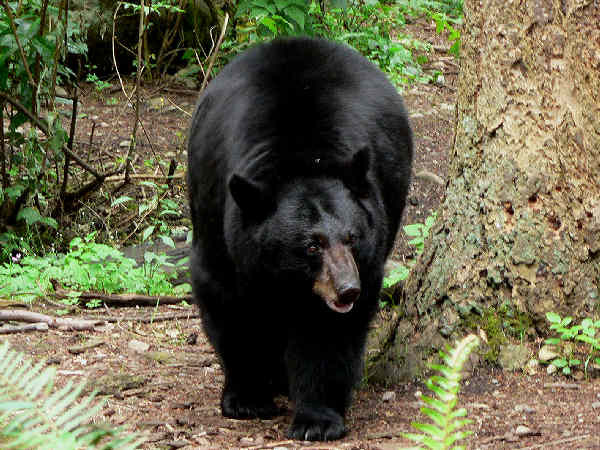 New Jersey’s success in reviving its black bear population during the last half of the twentieth century introduced new black bear problems for the twenty-first century. Increased bear populations, coupled with increased human populations, translated into increased human-bear contacts. While black bears are not inherently aggressive toward humans, their status as wild animals means that any type of human-bear contact introduces an element of danger, to both humans and bears (depending on the situation). During the past decade, black bear management in the Garden State reached the forefront of public debate, with participants assuming one of two general points of view. Wildlife advocates, including the Humane Society and the BEAR Group support non-lethal management practices such as public education and the use of bear proof trash cans. Hunting advocates support an annual black bear hunt. As the facts stand today, both sides have partially prevailed. The world’s most widely distributed bear, the brown bear (Ursus arctos), also known as the grizzly bear, a native subspecies (Ursus arctos horriblis), inhabits most of the Northern hemisphere forest areas in North America, Europe, Russia, Asia. Brown bear populations in the continental United States decreased significantly during the twentieth century. In 1975 they were listed as a threatened species. Today there are five different regions in the western United States designated as recovery habitats. About ninety per cent of the grizzly population is found in two of those areas, the ecosystem that includes Yellowstone National Park and an area in north central Montana that includes Glacier National Park. The U.S. Fish and Wildlife Service covers their status. Typically, brown bears grow larger than black bears, and their size is a function of their habitat. The availability of an abundant food source helps make the Alaskan brown bear, or Kodiak Bear the largest U.S. brown bear population. Males can grow to five feet standing up and approach a weight of one thousand pounds. Their continental relatives usually measure and weigh in about twenty five percent less. The Polar Bear (Ursus maritimus), the world’s largest bear, is also a northern marine mammal. Mainly carnivorous, polar bear diets depend heavily on local seal populations. Projected changes in future sea ice conditions, if realized, will result in loss of approximately 2/3 of the world’s current polar bear population by the mid 21st century. In 1995, the Bear Specialist Group with the IUCN placed the polar bear on the vulnerable species list. After a thorough review of polar bear population dynamics in the context of continued sea ice loss, the United States listed the polar bear as threatened under the terms of the Endangered Species Act. While bear attacks remain a relatively rare occurrence, practicing bear safety when traveling in bear country still makes sense. Whatever thrill one might get from seeing a wild bear should be tempered by the thought that often the most rewarding excursions to bear country are those that end with no bear sightings. They are strong animals, capable of inflicting great bodily harm on any person. Practicing bear safety boils down to understanding bear psychology and acting appropriately in their territory. North America’s three bear species inhabit a wide range of territory. With the exception of Alaska, home to all three species, or the Northwest, home to a small brown bear population, meeting up with a wild bear means meeting up with an American Black Bear. Depending on the climate conditions, black bears spend the coldest part of the year, winter and the surrounding months, hibernating. Eating, breeding, and for females, taking care of young cubs, occupies their time out of the den. Their strength and athleticism, including keen tree climbing and running abilities, give black bears an edge in any encounter with unprepared humans. Fortunately, they are not natural human predators, they are omnivores, content with a fruit, nut and vegetable based diet. Often it’s their extraordinary sense of smell for most food stuffs that leads them into human habitats. Knowing those few facts explains why the possibility of a bear attack increases when humans encroach on their food, personal space or young. The worst case bear encounter scenario involves an accidental face to face meeting. In those instances, most experts recommend speaking softly and carrying a big stick or bear repellent spray. If eye contact is made, experts also suggest lowering your glance, speaking in a low voice and attempting to slowly back away. In many cases, removing oneself from the bear’s territory serves as a sufficient bear deterrent. Charging bears present an altogether different problem. While perhaps counter-intuitive. experts often suggest humans hold their ground because bears charge as a bluffing tactic. Experts also remind us that bear swiftness insures a win in any foot race. What can the average individual make of this expert advise? One report entitled Bear maulings treated in Calgary, Alberta examined the fight versus flight theories of bear safety and came to mixed conclusions. Of the six grizzly bear attacks in the present study, two were predacious and four were defensive. The victims of the defensive attacks were hiking and hunting. The victims of the predacious attacks were camping. Interestingly, the predacious attacks were less serious than the defensive attacks in terms of injuries sustained and operations required. This is in contrast to the expected severity. Perhaps the predacious attacks occurred as a result of the bear looking for campers’ food and not the campers themselves. Another possibility is that act of playing dead was successfully achieved by these victims. It is important to note that individual bear activity or behaviour is extremely difficult to predict. Therefore, the actions of the victim may be completely irrelevant in determining the severity of the bear attack. Given the impulsive and irregular behavior or bears, anyone faced with imminent attack should be ready to fight back using spray, along with any sharp sticks, branches and stones in the immediate area.